Hello everyone and welcome to the end of summer! Let’s get into this months Blues shows. Finishing out this seasons run of Sunday Blues and BBQ’s at the Hotel Ledger is Jeramy Norris and the Dangerous Mood. This is a really nice spot and I highly recommend you bring your swimsuit. On Wednesday the 5th I will be hosting a Blues Jam at Fired Up Grill in Ceres. Sign-ups start at 7:30. Then on the 6th, you can head out to Garlic Brothers in Stockton for the Thirsty Thursday Jam Hosted by Jeramy Norris. On the 13th you can check out Jeramy Norris again at Black Oak Casino in Tuolumne. It’s a cool room and a nice drive, well worth your effort. I’m going to suggest you take a little tip on the 14th up to our state capitol Sacramento for a visit to the Crest Theater to see Kenny Wayne Shepherd. He has a string of hits, has several Grammy nominations and is one hell of a guitar player. There are a couple of cool events on the 22nd. You can head out to the LBGC fest and check out the B-4 Dawn band Featuring Terrie Londee for some funk, soul, blues and rock. Or you can head over to St. Stanislaus School for their annual carnival and check out Big Earl and the Cryin’ Shame along with a bunch of other acts. Boz Scaggs is coming to the Gallo Center on the 23rd. Boz is a Grammy award-winning singer-songwriter and guitar player who had his album “Lowdown” hit number 2 on the Billboard top 200. I have never seen him live but I have heard that he puts on a hell of a show. Lastly is a really special event celebrating John Blacks 65th birthday. It’s called “Rockin’ on the River Deuces Wild Rock’N’Blues Music Festival” at Del Rio Vista Garden. 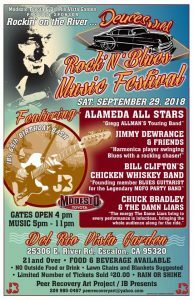 JB has a killer lineup including the Alameda All Stars, Jimmy Dewrance & Friends, Bill Clifton’s Chicken and Whisky Band (Of MOFO Party Band Fame) and Chuck Bradley & The Dame Liers. I’m going to feature JB on my first ever video companion to this column which should be out by the time you are reading this. 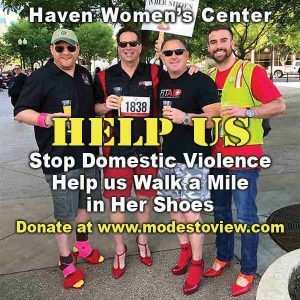 Check for it on Modesto Views FB page. As always I hope to see you out at a show.